Manufacturer of a wide range of products which include copper bottle, copper cutlery, snack warmer, copper steel handi with glass lid and copper jug. Backed with rich experience and knowledge in this sector, we are considered to be one of the most professional manufacturers and exporters of Copper Bottle. 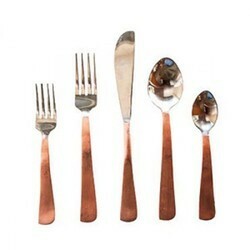 Backed with rich experience and knowledge in this sector, we are considered to be one of the most professional manufacturers and exporters of Copper Cutlery. Owing to the expertise of our team of experienced professionals, we are able to manufacture and supply an exclusive range of Snack Warmer. 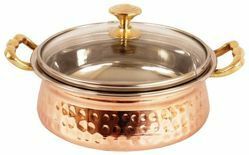 Owing to the expertise of our team of experienced professionals, we are able to manufacture and supply an exclusive range of Copper Steel Handi With Glass Lid. 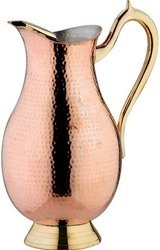 Backed with rich experience and knowledge in this sector, we are considered to be one of the most professional manufacturers and exporters of Copper Jug. 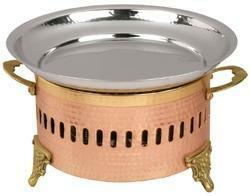 Looking for Copperware 1 ?